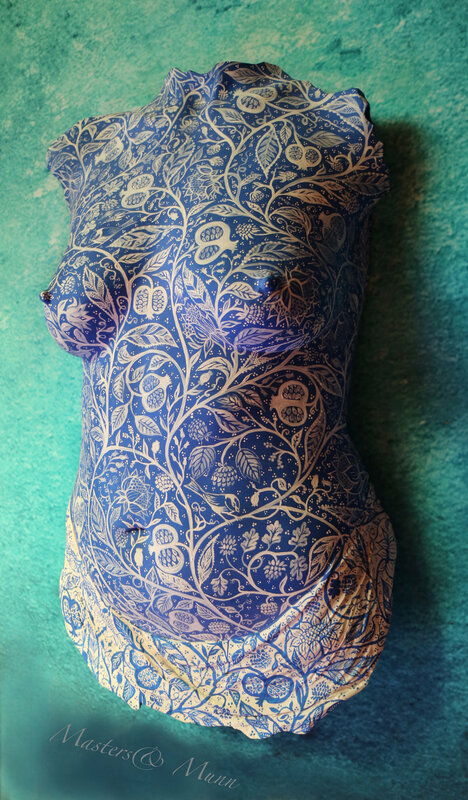 'Bluebird I' (frontal torso) and 'Bluebird II' (rear torso) are one of a kind lifesize stone cast nudes with exquisitely hand-painted detail inspired by the fabric and wallpaper designs of William Morris of Morris & Co. The reversing colourways of deep indigo on white and white on indigo are taken from traditional English pottery and the simple poses inspired by classic Greco-Roman nudes with a soft drape across the hips of the model creating added interest to the pieces. The pair would look stunning either side of a fireplace, pillar or other architectural feature. They can be bought individually at £2750 each or purchased as a pair for £4800 (not including delivery/installation if required). The sculptures are approximately 35x58x16cm (Bluebird I) and 40x61x18cm (Blurebird II) respectively. Each piece requires a single fixing point to be wall-hung and are, of course, only designed to be displayed indoors away from damp environments. Due to the material finish, any overseas orders may need to be delivered by a specialist art courier at additional cost. We are happy to put you in touch with our recommended couriers. UK delivery or collection can be arranged with us directly. To purchase, or enquire about a similar commission in other poses, patterns or colourways, please contact us using the details below.